Vidsify is the simplest way to convert almost any video file, such as those recorded on a point-and-shoot camera or cell phone, into formats supported by your Apple devices and game consoles. 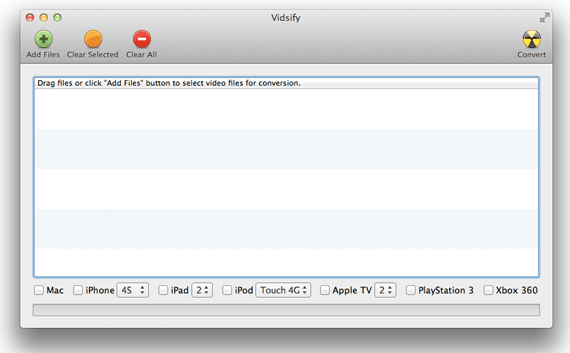 Vidsify supports Macs, iPhones, iPads, iPods, Apple TVs, PlayStation 3s and Xbox 360s. No knowledge of video or audio codecs is necessary, simply choose the devices your video must support and Vidsify will automatically determine the rest. In many cases the video and audio can be extracted from the original file and copied into a new format that your devices can play without transcoding. This way no video or audio quality is lost and converting takes seconds rather than minutes. Vidsify uses the H.264 and AAC codecs to ensure the highest quality conversions possible. Vidsify requires Mac OS X Lion. Need to convert audio? Try Tunesify. This software uses an FFmpeg binary that is compiled from unmodified source licensed under the LGPLv2.1. The FFmpeg source can be downloaded here. Vidsify also includes an FFmpeg binary compiled with the X264 library licensed under the GPL. This binary is included as a plugin and is only used for videos that require transcoding to H.264. All other functionality is still available when this plugin is removed.